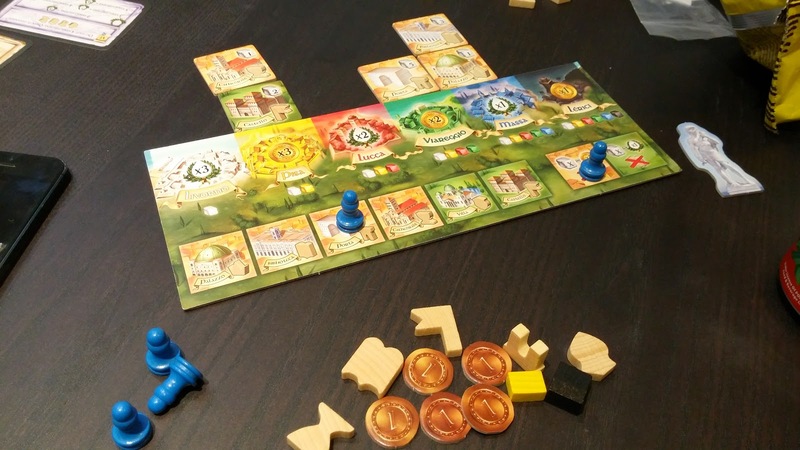 First up is Fidelitas which is currently in Kickstarter. I got the Print and Play version and wanted to try it out with 4 players. I had played this earlier with 2 and found it rather interesting so I was wondering how it is with 4. The game is quite simple. During your turn you will play a card. Each card has a Guild symbol on the top left corner and if the card you played has a symbol that corresponds to a location on the play area, then you must play it there (usually there are 2 available spots). Otherwise you can play it anywhere. Perform the action stated on the card you have played unless the card was played to the Tavern. Complete as many mission cards as you can (each player starts with 2) and draw that many new ones. Finally, draw a character card. In this way, game continues until a player reaches a set number of points (Depending on number of players) and at the end of the round, players check to see who has most points for the winner. So for a 2 player, this game is quite alright as you can plan and execute your plans without much hiccup. 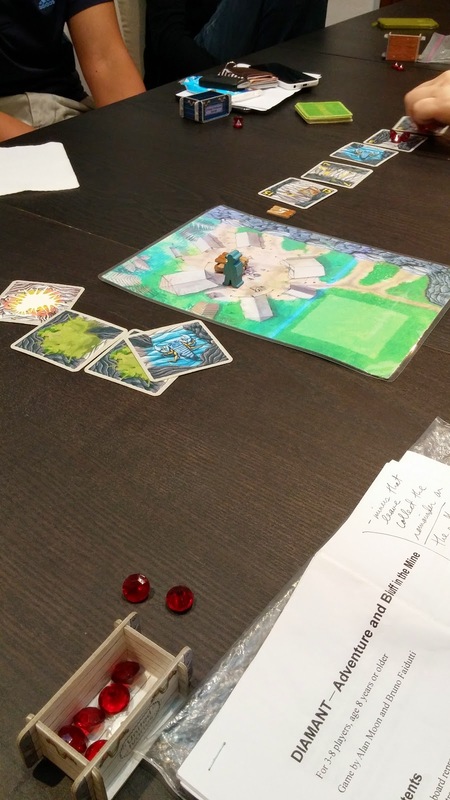 With 4 player there is more chaos and by the time it comes to your turn, the board may have changed and you may no longer be able to complete your mission. The Tavern is vital for switching your objectives especially if played with more than 2. However its other power which allows you to select a card when drawing from the opposite location is rarely used for its intended purpose. Art is gorgeous and feels very disney like. In essence it is a light set collection game where you are using the various card's action to arrange the board as your mission requires to score points. It is quite suitable if you are looking for a quick and fun lunch time game in the office or a filler. TRY BEFORE BUY. My final board. Even though the white rail was so high up, I did not win.. I started to grab as many of my workers out as possible and then focus on my Siberia rail line. I was dead last though in the early rounds as my plans will not net me points until much later in the game. However the first instance I was screwed was when the No.9 train was taken before me. If I had grabbed it then my Kiev line would have started generating points before Round 3. Alas it was not meant to be and I had to refocus to get back on track. Other than that I did not notice much blocking from the other players but I did not win in the end. I recalled that if you are going for the Siberia line you have to obtained it by Round 3. Otherwise it is more difficult to win. My final round netted me 110+ points and I scored 354 in the end and was 3rd. I had fun even though I lost. Now after playing it several times online, I am happy to report there are several ways to victory. I have also managed to play it 2 player which does present several interesting angles because you are allowed to select the same spot for turn order and there are quite a lot of action spaces not accessible. 2 players is tight and often quite intense as any mistake can be costly. 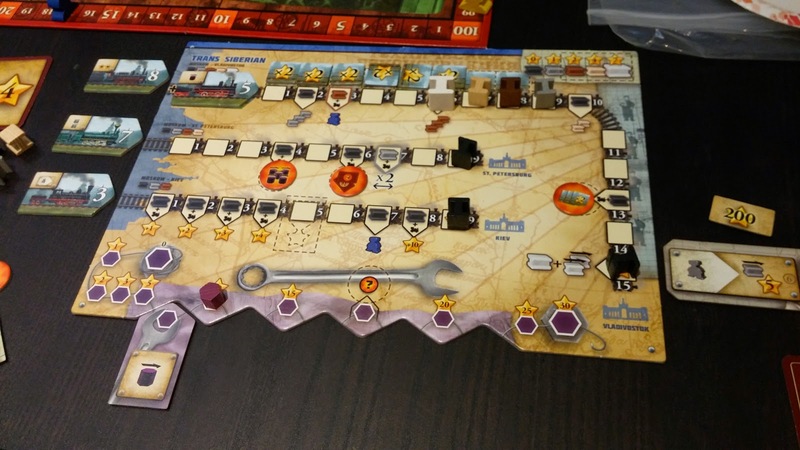 I still recommend Russian Railroads and still my best game of 2013! RECOMMENDED! Next up is Palaces of Carrara. 3 others have not played this before and I have only played it once a really long time ago so after a not-so-quick rules refresher (because we played with the expansion which I mistook for the expert variant) we are off. 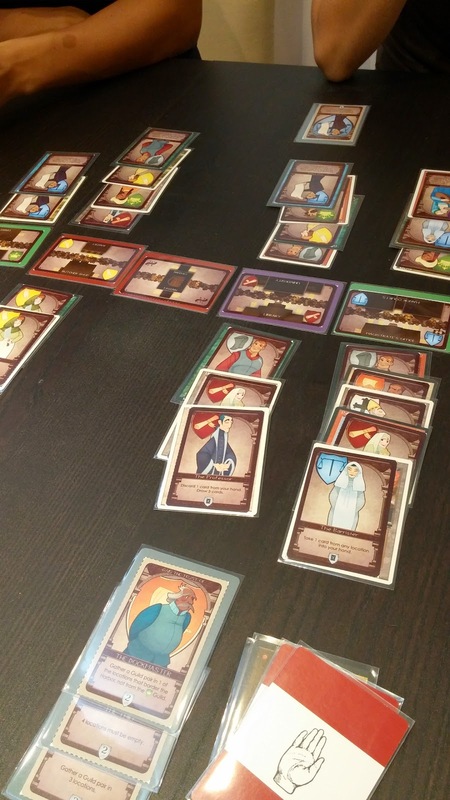 Palaces is essentially a race-style set collection type of game. Players decide to spin this big wheel (or not) and then choose a section of the wheel to buy blocks from. The reason to spin is because the section of blocks you may want could get cheaper. For example, white block costs a lot in the beginning. As it travels the whole circumference, it will become as cheap as 1 coin. Players can also choose to get buildings by paying the purchase cost in blocks depending on which city they are building it in. Each city accepts different colours of blocks and you can pay in any combination. Players can also choose to score. They do this by placing one of their scoring pawns (each player has 6) into a particular segment and score accordingly. They will usually get money and/or points in return. The game ends when a player can fulfil the 3 objectives and declares it so. Then players will score by the objectives and whoever has the most points will win the game. 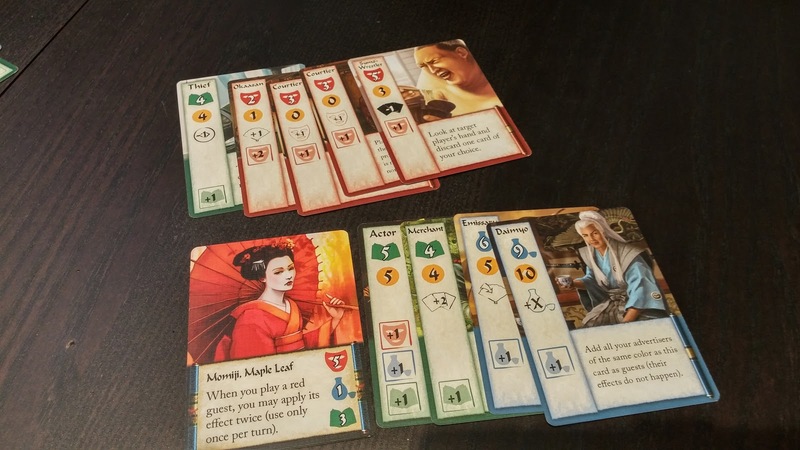 The expansion adds in several interesting mechanisms to the base game. There are now buildings that cost 8 blocks to build which will also give you benefits you can choose from. There are new objectives that you can select at random at the start thus ensuring all games will be different and increasing replayability. You can also now choose not to move the wheel so that new blocks will not appear and pay as it is. All in all, I would definitely say add in the expansion to make it a medium weight game instead of the light weight it previously was. As in most race games, I waited too long before I started grabbing resources and scoring. Being the start player I also had to pay attention to my opponents because if they declare completion of the objectives, then I would have lost my chance at another turn to catch up, which happened in this case. I think I need to figure out just when to declare and when to stop getting blocks and rush for the victory. Luckily I can now play this on yucata.de (send invites to duckizz) and practise and get better at this. For now though it doesn't include the expansion but I believe they will provide that option in the future! TRY BEFORE BUY. Next up, since I managed to convince Jonathan to try Zombie State! He managed to convince Grace, through force of will, to play it with us as well. Jillian wanted to give it another go to confirm to herself whether she likes this or not. 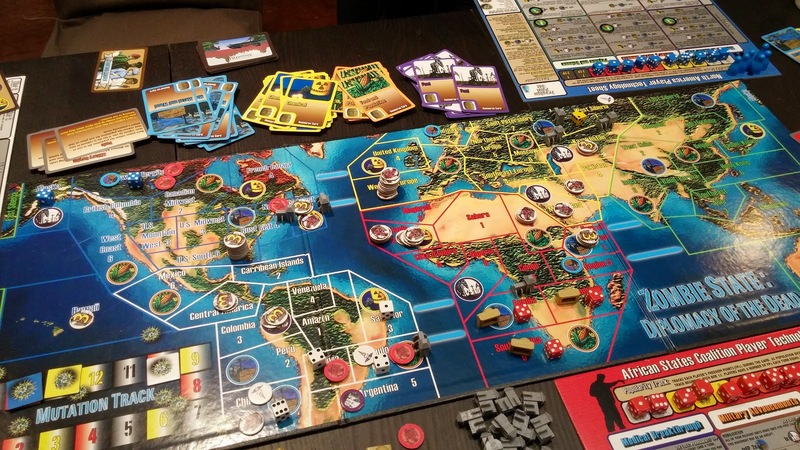 Since there's 4 of us, Asia was not in play (it seems that the zombie plague had wiped out Asia! OH NO!) and we randomly chose our nations. I happen to chose last and got South America again. This time though we played with the free expansion which you can get from Zombie State website. What this does is when you are performing research if you fail, you get some bonuses which makes your next research attempt not so painful. I do recommend this next time anyone plays Zombie state as it is now more playable. OMG I am South America again and I won! 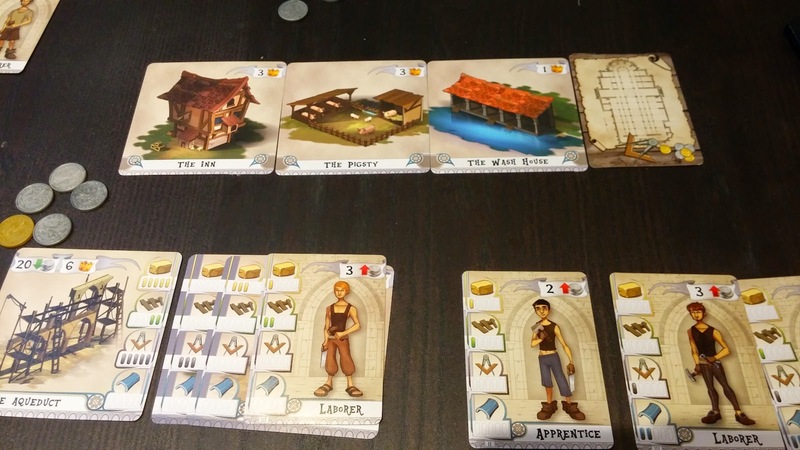 Next up The Builders: Middle Ages. I got my own ding and dent copy for cheap but we played Dion's copy. Hmm now that I think of it, I wonder if there's a future expansion called The Builders: Late Ages or something. Anyway, not much interaction as we mostly just tried to do the best with whatever we have in front of us. I do like the artwork a lot and its ease of play. But wish there was more interaction between us. I do hope there maybe an expansion along the way to make it more heavy weight and increase interaction. Argh! Victory snatched from me 1 turn ahead! Grrr.. I was about to win but Grace snatched it from me. Since I started the game, I could not do anything else to score more points to try to compete with Grace. So quite anti-climatic for me. Might not be something I will hang onto for long. I will give it a go with Wifey to see how it works as a 2 player. Also I am beginning to dislike games where if the end of game is triggered then players play till the end of that round, especially when earlier players no longer have any chance to make 1 final move. TRY BEFORE BUY. 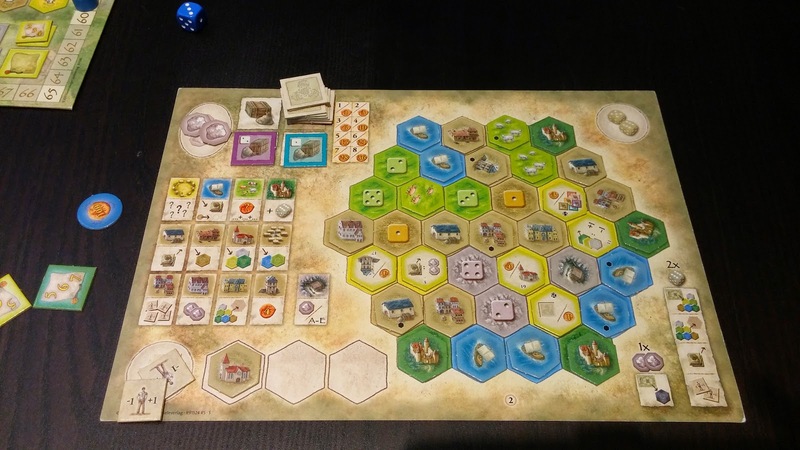 Next up, Castles of Burgundy! I have been playing a LOT of this online with Dion, Seng Chin and Jillian and I thought I have a pretty good handle on things. Well little did I know Jonathan would have noticed what I wanted and block me (see that brown building gap that I have? that's Jonathan's doing). I was doing pretty alright too but near to mid game I kinda lost focus and could not grab as many goods as I wanted to. My combination of selling goods to get 2 Silverlings was pretty powerful as it meant I had the flexibility to buy tiles. I just did not utilise it enough. Super blocked by 2 players and ended up last. Otherwise I would have been first. Jillian also decided to block me at the end though I am not sure why she decided to grab a Ship tile when I had 2 ready in my stash to lay them out. Shrugs. At this point though I am pretty used to Jonathan and Jillian blocking me in most of our games but since I have not played with Jonathan for some time since he was on holidays, their moves definitely did mute me. So ended up last. Still loving the game though with its flexibilities and high replay value. You can also play this now on Boiteajeux.net. We played Mai Star again and this time we were all quite competitive as we played cards to remove advertisers and customers so it was not as easy as my first game of this at Dion's place. I think this is a game that is quite dependant on the group to make it fun and interesting. If people are just playing the cards as is without guarding and all, then it can be too simplistic and maybe a boring card game. However if people make sure to guard each other and be wary of the powerful cards like the Monk, then it will be a challenging and fun game. If everyone plays this VERY competitively, it can be quite tough to score and win! I agree with Jonathan that while we love Seiji's original art, AEG's version does it quite well as the colors are very rich and diverse. The theme might put some people off but for us it has been a load of laughs whenever we play it as we imagine we are mama-sans. :P TRY BEFORE BUY. 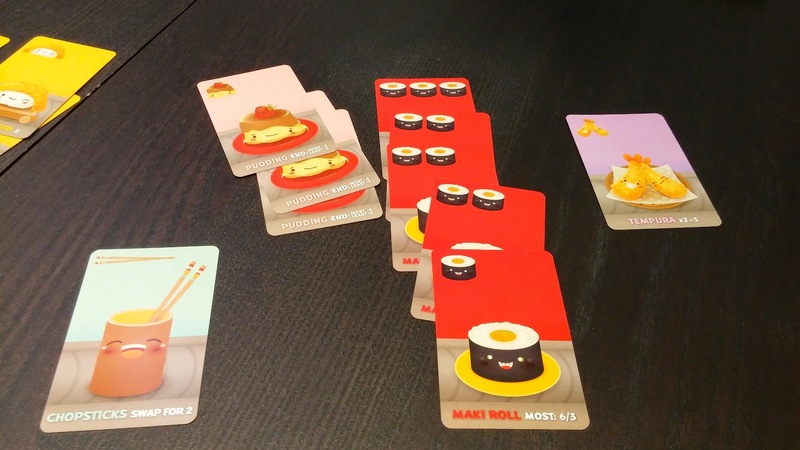 From 1 game with a japanese theme to another, we gave Sushi-go a try. I think this game is beginning to wane on me. While there are some decisions as to what you want to collect and you can try predicting and watching what others have played to know what cards will come back to your hand, ultimately though I find it too light for my taste. It certainly is meant as a filler but after playing Oink games offerings, I think this type of light filler is, well, too light for me. Finally, after the other table has finished their Terra Mystica, we decided to play Diamant or Incan Gold. This seems to be a prettier version because we all had little carts instead of a folded tent to store our gems and the gems look better too! We also used Meeples to indicate whether we are In or Out, which is much clearer than Incan Gold. Diamant - Its exactly Incan gold! Not sure what Jonathan was doing but he seemed to be doing a Tom Vasel in that he just kept pushing his luck and he ended the game with 0 gems. It could also be the late/early morning haze that made him slightly loopy. With SO MANY players, it pays to cut and run quite early on because often the leftover gems on the card can be quite substantial. Grace did this and managed to grab a very large sum of gems because when she ran, most of us still decided to go on as we were, well, greedy. I think this version is better but I think it will play better with 4 or 5 and not with 8. Quite a good filler in my opinion. 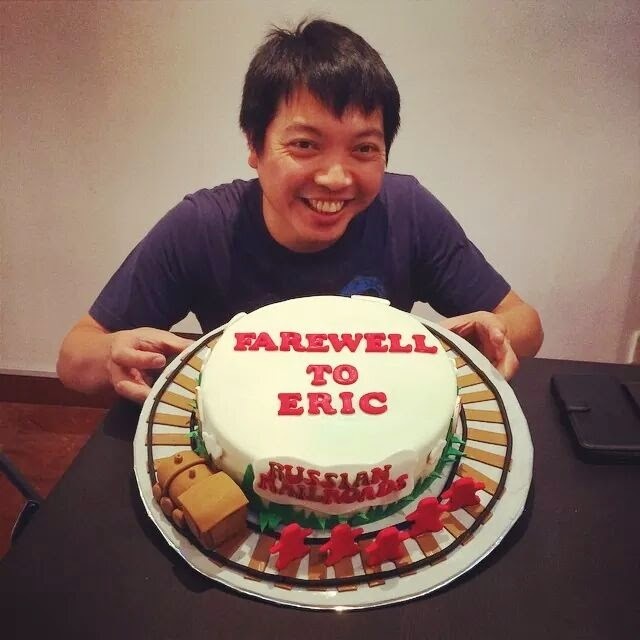 so awesome surprise.. and my best game of 2013 on the cake! Well, in a way I thought it may be funny and etc but quite sure it is time-consuming and tedious.